Well just a lot of stress from Autism and the little things that go along with it. I am also very nervous as I was invited to be on a local news channel this Saturday morning to participate in a book discussion on The Art of Racing in the Rain by Garth Stein. I really enjoyed the book and looking forward to it...but still nervous. We finished up talking about volcanoes and waiting for our volcano to dry so we can paint it. We created glue from our Ancient Science book....and it seems to be taking a while to dry. Brayden has also discovered a liking to Magic Tree House books, as long as they are on his iPad and I read along with him. Chapter books are very overwhelming to him, but working together he enjoys them. Lydia and I begun reading the Wizard of Oz. We had a brief discussion about the many gods of Ancient Egypt. We learned a lot about Zebras for our animal study. We watched our ladybugs...which are still in larvae stage. We are going to start our ladybug unit tomorrow afternoon (yes Saturday school..but with the week we have coming up, it's the only time to fit it in. So we will be doing school work Saturday and Sunday afternoon to make up for the upcoming days off we will have this next week.). The girls went to a pool party at their friend Amelia's house. They had so much fun, they did not want to leave. We'll be going again this next week. The girls also had American Girl Club on Thursday. We made really cool feather barettes for our dolls (or ourselves) and we learned about root veggies that the Nimipuu Indians ate. We brought a morter and pedstal to show how they ground the bulbs and seeds into flour to make cakes out of. The girls also played a pine cone throwing game. The boys had a dr. appt for med checks. The girls and I went to the library where they logged up to 34 hours now reading. By Monday when they go back they will get another treasure box prize and the boys on Tuesday will also. I'm trying to keep their hours even as possible (even not counting hours they read) so there is no fighting over how many prizes another child has gotten. They chose new books and Lydia chose a cool inflatable puppy from the treasure box. Next week...pool party, Agility therapy starts back for the boys, our Homeschool Resource Sale, maybe a delayed horse lesson depending on the weather, and I know I am forgetting something! Figuring out where and when to use the review product that is on its way to us. Pretty excited about the two packages we are waiting on!!! I wanted to do a happy dance when I read we were getting the one! Just wait and see. The first post will be by September 5th. Wizard of Oz (with Lydia), Magic Tree House (with Brayden), Mr. Popper's Penguins (with Joey...not sure if he's going to like it yet), Lots of Kai-lan and Backyardigans with Caty. Oh and I'm reading Tears of a Giraffe (love the #1 Ladies Detective Series). I'm pretty excited that I can load a Kindle app on my phone and have a book no matter where I am. I am waiting to see what the new Book Club book is for the local news channel 11. They will announce tomorrow while I am at the studio. You ever just had one of those weeks?!?!?! 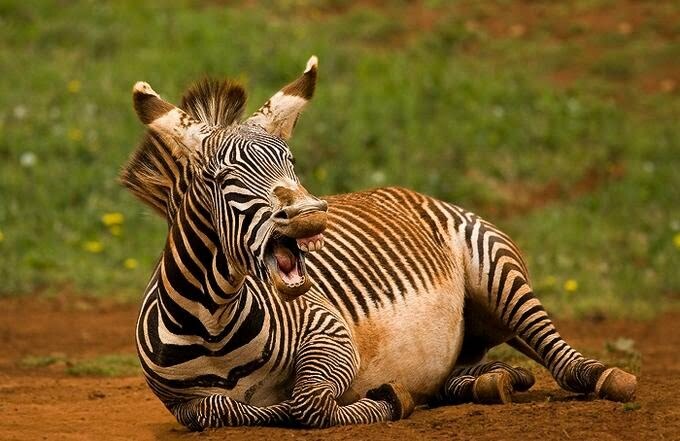 I feel like this poor zebra just struggling to get up and moving around! Linking up with other Homeschool Families at The Homeschool Chick...click here to join in! We are working hard at being as eclectic as we can be this year. I cannot call myself an Unschooler because we will be using some set curriculum. But I am trying hard to have a layed back approach with several fun options to keep the kids attention. *Science---I had chosen habitats for the start of this year, using the Hands of a Child Series. But we are going to bounce around in this area now. I was starting to plan some dinosaur activities, and then Lydia requested some Animal Studies. So we will be working on animals alot over the next couple months. We will be including habitat information and the library has walls of books to keep us busy! We will also study Outer Space in September, the Human Body in August, and Germs too. I am going to let the kids choose the animals and in what order. Joey also requested some Simple Machines and Magnetism units. So this winter we will be exploring that as we will be snowed in more by then..lol. We will be using the Wildlife Explorer series to help supplement and Joey was drooling up a storm at the Magic School Bus science kits as well as the science kits he found at Hobby Lobby. So I have already started stocking up so we are set and ready to go. *History---Story of the World Volume 1 and we will be including History Pockets into the appropriate areas. To go along with this we will also be using an Ancient Science Experiment book, so we will be getting plenty of Science!! *Geography---We will continue using Erica's Expedition Earth program, but not concentrate on it as fully. We will start US Geography this year. But waiting until fall. I plan on using alot of board games and activities to help in this area. *Grammar and Writing---We will be using everyday life for this. We will be doing some letter writing with some older ones in our Congregation. Each boy also have a blog that they will be updating weekly, with my help to write out full sentences. I also found that the Summer Bridge books have awesome...awesome grammar sections. We have been working through these currently. *Typing---Typing Instructor. Still waiting on the disk to come in. We have gone through so many typing programs, my head spins just thinking about them all. So maybe...just maybe we will have a winner here. *Lots and lots of games and activities for Fine Motor skill and Critical Thinking skill activities. *Math---She is working on Math U See Primer. We are also using lots and lots of games to introduce and help her grasp some of the concepts she is struggling. Right now it's plain number recognition. But we are working hard on it. *Phonics---We are going to continue with Headsprout and keep throwing in some lessons from Teach you Child to read in 100 Easy Lessons. We are going to continue using workboxes and I promise to start posting weekly on Wednesdays to show what we are doing. I just fell behind with everything that has been happening. Have a wonderful school year...we already are!! !